Agreed. I thought the idea that they would just conclude "WHELP, Earth is done for and we better find a new planet to live on" was kind of silly. Like, really? You couldn't figure out how to fix this problem besides burning infected crops? Did you try growing your crops in quarantined environments? Did you try genetically engineering a fix to the blight? Did you try ways of reintroducing oxygen to the atmosphere?" The problems brought on by the blight did make life look pretty bleak, but not so bleak that I felt abandoning Earth for a barely habitable rock orbiting a black hole looked more attractive. Then again, I guess if a freaking wormhole opens up next to Saturn while all this is going on, you go explore it. They also clearly have some pretty advanced artificial intelligence systems, surely those systems would be capable of helping to solve the problem. Secretly of course, since everyone thinks the moon landing was a hoax. The wormhole in interstellar looked fantastic, but it irked me a bit in a way that not many people seem to understand my issue with it. When entering the wormhole it looks like one would expect, they are hugging a sort of edge to the throat while the "tunnel" is not visible since light does not traverse the void within and rides the edges giving you a bulging distorted view. Clearly you see a tunnel, you see rippling walls, and an empty void between them. This seems counter to how a wormhole should appear. Wouldn't the "tunnel" be invisible since it is not comprised of a medium through which light could travel? DoctorOfSpace, correct, the way I think it would look would be more like a black hole, without the black. Imagine a black hole in space engine. When you pass the event horizon, it grows smaller behind you. What if the event horizon is actually where the two points meet. The wormhole itself would look like a blackhole with a projection of the other side on the event horizon. When you pass through the event horizon, the place where you went in becomes the new event horizon projection. Instead of there being darkness ahead, there would be the new sky seemlessly. If your camera was on the event horizon, half your view would be filled with the sky on one side and the other half filled the the sky on the other side. Hornblower, what you described is what I said looked fine with the wormhole. The wormholes in SpaceEngine work in much the same way, instead of a black region you have a distorted visual section of wherever the wormhole goes. 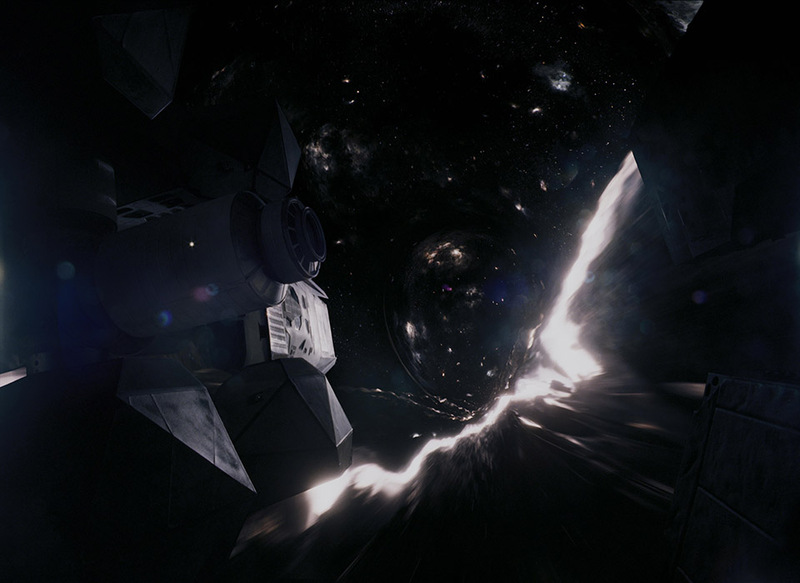 The issue I am pointing out however is what Interstellar portrays inside of the wormhole. Those mounds and ripples, if taken at face value would be highly disturbed regions of spacetime which would lead to apparent FTL motion within the wormhole. To me it looks like they took a 4D construct and moved all the effects down a dimension, now the tunnel itself is 3D and the 3D walls are 2D. The Endurance is even seen at one point riding along this wall within the tunnel, yet the Endurance is made of materials that should be embedded within the wall since the medium through which they exist is space itself. DoctorOfSpace, basically, Intersteller is depicting a 3d shadow of a fourth dimensional construct (because most people wouldn't understand the fourth spatial dimension). It is always annoying how people think the fourth dimension is time. I think of it as the 4th spatial dimension (as it should be), a far more intriguing explanation. Imagine being able to see the insides of everything the same way we can see the interior space of a piece of paper. This video also shows what one could potentially expect to see, however it also disregards throat length and other effects. There is no apparent wall or boundary, just a distorted transition from point A to B. I may be missing some key piece of information however, but it seems like there is no need to invoke any higher dimensional aspects when visualizing the wormholes since we would only be capable of perceiving those within 3 dimensions. but it seems like there is no need to invoke any higher dimensional aspects when visualizing the wormholes since we would only be capable of perceiving those within 3 dimensions. That's like saying since we can't understand the full scale of the universe, we should just ignore how amazingly giant it is. When it comes to the unknown, thinking about things impossible for our brains to understand is quite entertaining (like a perception of the fourth dimension). Also, that video perfectly describes how we think a wormhole would work. Nice find! DoctorOfSpace, I just thought of something fun to speculate about. What if we took one "end" of the wormhole and completely surrounded it with mirrors (shiny side in). I wonder what it would look like from the other end. Would it be invisible? Would it be like a spherical mirror? I thought so, too. The external view was absolutely gorgeous and realistic. One of my favorite moments in the film is them approaching it; the visual and the rumbling of tidal forces combined with that music was awesome. The transit, sadly, was not realistic. They had seen the simulations of what it would look like, but Nolan decided to go with something else that was more exciting. Which I can understand, but ugh. The visual we actually get is pure fantasy. My understanding (not 100% certain of this) is that the longer the throat of the wormhole relative to its opening, the more lensed images you see inside, and the more proper time it takes to pass through. And in reality, there would be no obvious moment of passage from inside to outside, just like with the event horizon of a black hole. It is always annoying how people think the fourth dimension is time. I think of it as the 4th spatial dimension (as it should be), a far more intriguing explanation. The fourth dimension is time. Space-time is three dimensions of space and one dimension of time, and it has a different geometric character (the time dimension is not like an extra dimension of space). The geometry is Minkowskian rather than Euclidean. We can of course consider 4D Euclidean space in which the 4th dimension is another spatial dimension, but that's not the environment in which general relativistic objects like black holes and wormholes exist. Yes, there would be no tunnel. Kip Thorne said in the talk in Oslo Wednesday that Nolan had seen the scientific simulation and called him up saying "this is not going to work". Nolan wanted a Hollywood style wormhole. So in the film you see the scientific version up to the point where they enter the wormhole and Cooper pushes the joystick. Then there is a switch to Hollywood visuals. It looks ridiculous. One other aspect about wormholes is that time at either end might flow in different speed. For instance, what would happen if Interstellar had a wormhole with one exit on Miller's planet and another exit on Mann's planet? Then you could enter at Mann's planet and go back in time when you arrive at Miller's planet. If you leave that planet by spacecraft you'll arrive at Mann's planet before you left it through the wormhole. If the wormhole had been open for one hour on Miller's planet, you could then go to Mann's planet 7 years before the wormhole was opened on Mann's planet. Then you could also wait for the wormhole to open on Mann's planet and go back in time on Miller's planet and wait for your own arrival there. Obviously, this doesn't make sense. There is a paper I read a while back that discusses different throat lengths and widths and you are not far from what it suggested. I cannot remember the name currently, will have to look for it. I am curious about what sort of relativistic effects, if any, one would see from inside a wormhole. and the more proper time it takes to pass through. This reminds me of a conversation I had recently with someone who was claiming a wormhole by definition is faster than light when in theory you could have a throat longer than the normal distance. And in reality, there would be no obvious moment of passage from inside to outside, just like with the event horizon of a black hole. Well you would see a gradual increase in distortion and as you exit it would be a gradual decrease in distortion until the distortion was just gone. I guess you could say there is no obvious moment of passage but it would still be quite obvious that you were no longer within the wormholes sphere of influence. Kip Thorne said in the talk in Oslo Wednesday that Nolan had seen the scientific simulation and called him up saying "this is not going to work". Nolan wanted a Hollywood style wormhole. Did anyone record it by any chance or is there a similar talk available? I don't think it was recorded. It was a quite informal event. Of the more serious stuff, there are some recordings here. Do you mean that as in being in the center of a wormhole? It would be impossible to be "in" a wormhole because there is no spacetime in the middle, just another section of the universe. The best way to think about it is the 2d space with a 3d wormhole idea. The 2d universe would be bent so two parts of the universe are next to each other in the 3rd dimension and where they intersect, there is no space time; it just bends around into the other section of the universe. Therefore at the center of this theoretical wormhole, there would just be a hole in space-time. Or do you mean if two ends of a wormhole experienced time differently. Let's say one end of the wormhole was next to earth and the other end way next to a black hole. How would that affect data coming through? In what way would it distort the data? Who said that there is only 1 dimension of time in our universe? I think we have 2 dimensions of time. Allow me to explain. If our universe only had 1 dimension of time, then everything in the universe would move through time at the same speed. However, in our universe, some places experience time to be slower or faster relative to time outside that space.Or maybe I am just being narrow-minded and still have a lot to learn. Or maybe I am just being narrow-minded and still have a lot to learn. Think of time and space as one and the same. The faster you move through space, the slower you move through time. The faster you move through time, the slower you move through space. Correct me if I'm wrong, but as I understand it, you're always moving at a constant velocity through spacetime.